The RNZAF originally purchased 18 FB.5 single-seater Vampires in 1951 to equip No. 14 Squadron at Ohakea. Because of accidents, eight second-hand Vampires were procured in 1953 as attrition aircraft, with another 26 arriving in 1955-1956. The RNZAF deployed No. 14 Squadron to Cyprus in 1952 where they were equipped with loaned RAF Vampires. The Vampires left at Ohakea were then used to reform No. 75 Squadron. They served in a day fighter and ground attack role, and later as a jet conversion trainer within New Zealand until 1972, when they were replaced by the BAC Strikemaster. One of the eight second-hand aircraft purchased from the UK in 1953, NZ5757 was brought on charge on 12 September 1953. It served with No. 75 Squadron, the Fighter Operational Conversion Unit, and the Jet Conversion Unit at Ohakea between 1953 and 1960. It then went into temporary storage and was converted to an instructional airframe (INST 193) on 21 April 1964. NZ5757 was then given to the Central Institute of Technology at Petone in 1965 (but not delivered until 1972) before being given back to the RNZAF in 1978 and shipped to the Museum at Wigram. 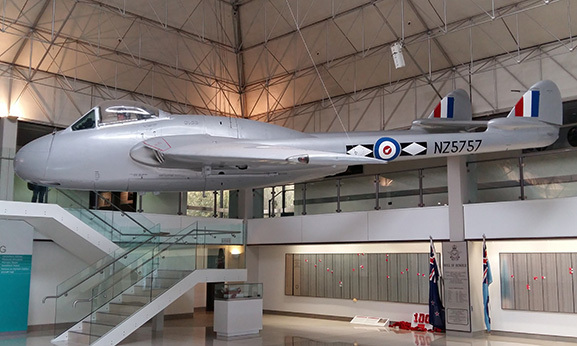 The Museum has another Vampire F.B.5, NZ5765, currently on loan to the Wanaka Warbirds and Wheels attraction at Wanaka Airport.